Thanks so much everyone! I can't tell you how excited I am now that DH has successfully funded. The game has had a storied past just getting off the ground. It's because of fans like you I put forth the effort I did, and worked so hard to make this happen. I couldn't have done it without my fellow team. Musician: Ponyo — who created the demo tracks in the demo right now! Editor: Shadocchi — who translated my crude barbaric english into something understandable! Writer: Funnyguts — who was both a writer and a creative consultant on the project! I think a year ago I would have quit by now if there weren't people genuinely interested to read my stories, who got it. The outpouring is so overwhelming that I never expected to reach my goal until the very, very end. 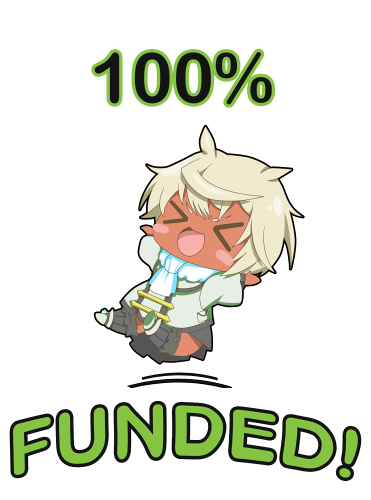 I'm incredibly happy DH is funded. I'm not done yet, as much as you put your faith in me, as much as you give me your opinions about what you like I'll show you cool stuff! Thank you! I'll be putting up more stretch goals later today with the main update! Thanks! if you have any more ideas for stretch goals, big or small, please tell me here~!